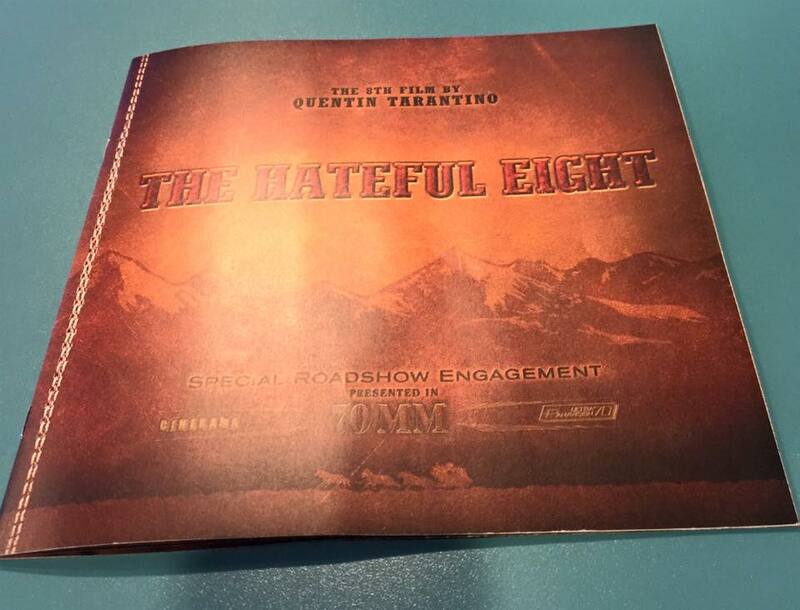 The Hateful Eight (70mm Roadshow version). 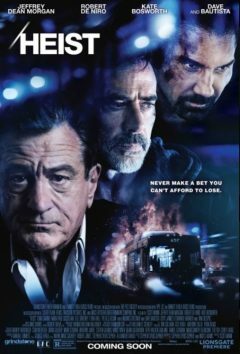 187 minutes, w/15 minute intermission. 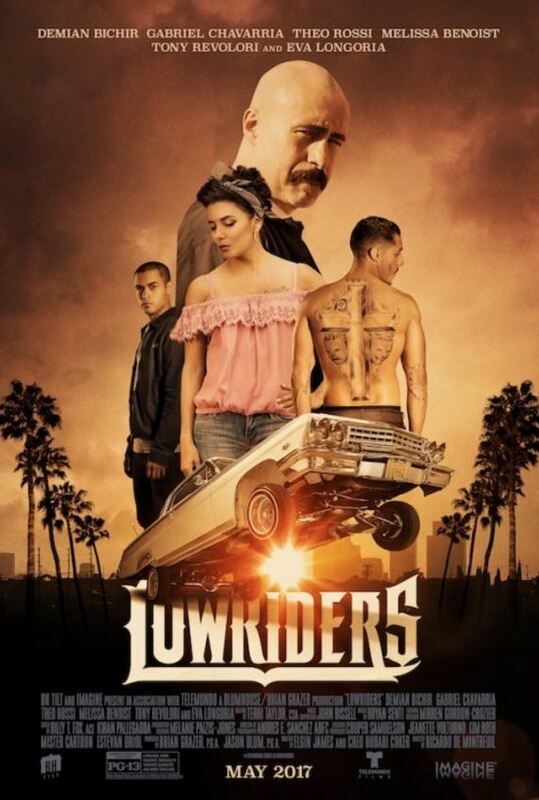 When the second part begins, the movie fills in the gap with a voiceover read by Tarantino, explaining what happened in during the previous 15 minutes. Although I’m happy for Tarantino giving the larger-format 70mm a boost, with 98 theaters getting the large old 70mm projectors, I’m not thrilled with the outcome. Most of the film is set inside a traveling stagecoach or later inside a one-room general store. It’s like an Agatha Christie stage play in which the suspects are gathered in the drawing room, each with a secret. But instead of Christie’s country squires, matrons and colonels home from the colonies, we’ve got Samuel L. Jackson and a passel of murderers, bad-asses and bounty-hunters holed up in a storm trying to figure out who poisoned the coffee. The Tarantino bloodshed is even closer-focus and more nihilistic than usual, in a style reminiscent of Sam Peckinpah, Sergio Leone and modern slasher films. 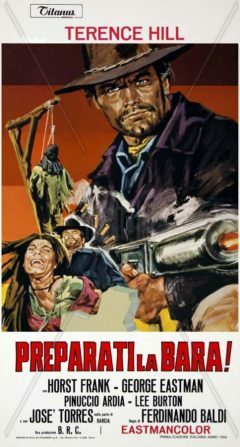 The color palette is dark brown, and the score uncharacteristically gloomy for the melodic and masterful Ennio Morricone, who scored Leone’s 1960s Spaghetti Westerns. 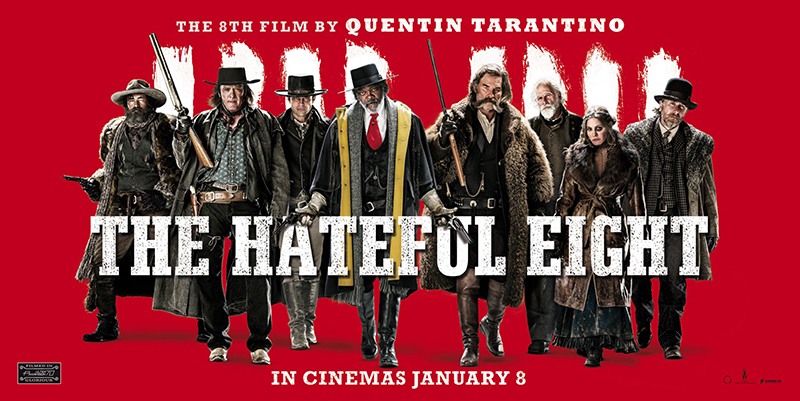 Hateful Eight makes more of a political and ethical statement than Tarantino usually makes, with several heartfelt monologues on justice, American ideals, and a few speeches by Jackson on what it’s like to be a black man in the Civil-War era. But no one speaks for the women, almost all of whom are murdered within 10 minutes of their appearance in the film. Tarantino always keeps his eye on his source material. Here it’s Spaghetti Westerns. 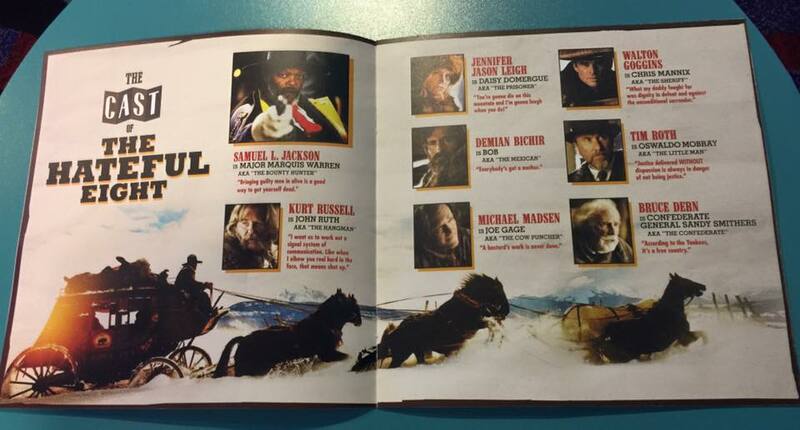 With its Ennio Morricone score and theme of bounty-killers who travel by stagecoach to a snowed-in mountain town and proceed to kill each other, The Hateful Eight evokes nothing so much as The Great Silence (1968, Sergio Corbucci), one of the finest Spaghetti Westerns ever made. But in spite of Tarantino’s devotion to his predecessors and the filmmaker’s craft, I don’t think he made effective use of the wide 70mm film format. 70mm has an aspect ratio on the screen of 2.76-to-1,which is significantly wider than other films, which are 1.85 or 2:39-to-1. 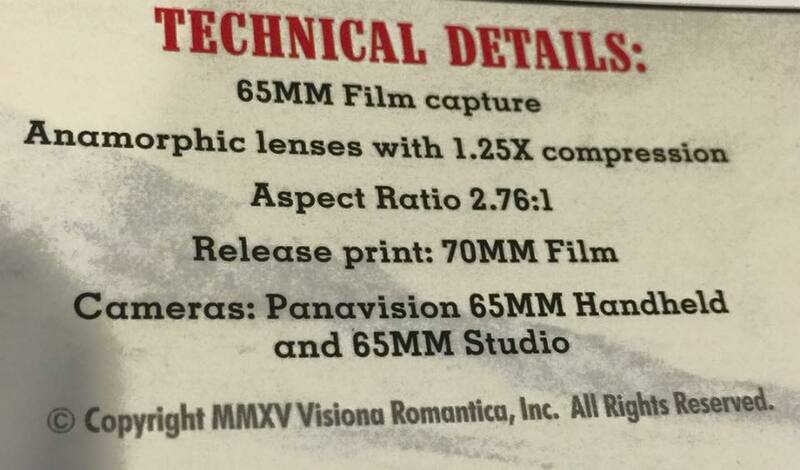 Tarantino doesn’t take advantage of the wide format the way previous 70mm films did. Older films blended form and function, using the wide aspect ratio to depict wide things, like the vastness of space as in (2001: A Space Odyssey, 1968), the open sea (Mutiny on the Bounty, 1962) auto racing (Grand Prix, 1966), or Mediterranean landscapes (Ben-Hur, 1959). Hateful Eight uses the screen size for something else entirely – to divert our attention from the small space of his one-room setting, to pull us closer into the dialog or to spigots of shooting blood. Quentin Tarantino loves the movies, and it shows in about every frame. His own films are always an appreciative commentary on cinema. Perhaps for this reason, I always leave a Tarantino film feeling the same way, liking the films that inspired him much more than I like his films. December 31, 2015. 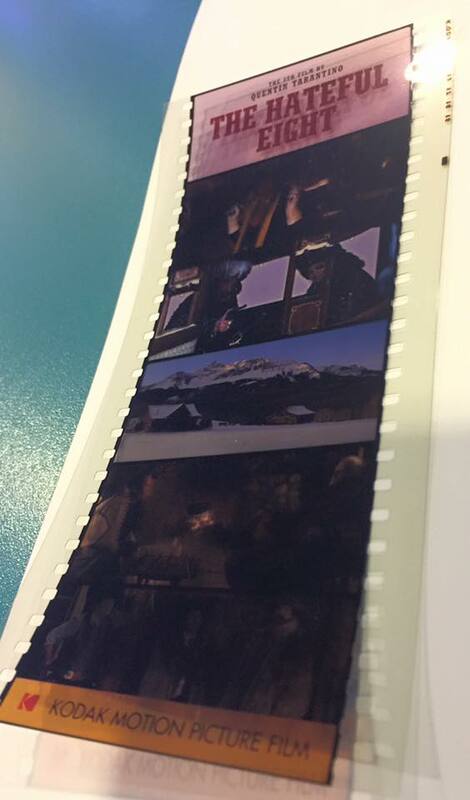 At the 70mm screenings, they gave us a program and a short few frames of 70mm Kodachrome film from the movie. This weekend I discovered and have been reading Emptiness And Joyful Freedom by Greg Goode and Tomas Sander. What a gem to discover in the mine of so many books currently available on spirituality and meditation. Although I’ve just read a few chapters I’ve experienced a taste of the joyful freedom from a few of my long held conceptualizations. I am looking forward to utilizing the meditations from the later part of the book. I am grateful to the authors and publishers for producing such a profound book with everyday practical relevance. Thank you so much from the Greg-half of the writing team!! !